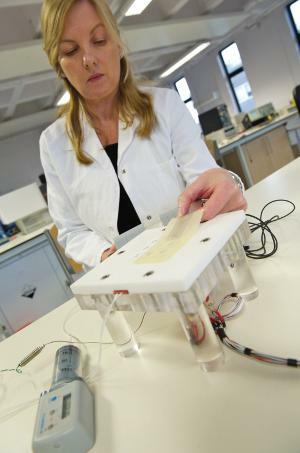 The WoundSense™ moisture sensor, which was developed by Ohmedics ltd, a company set up by bioengineers at the University of Strathclyde, allows doctors and nurses to check the moisture conditions under a dressing without having to remove it. WoundSense is a sterile,disposable sensor placed in the wound dressing that monitors whether the wound is moist – the optimum environment for healing – or too dry or wet to heal properly. now the technology is to be used in a new trial in military personnel requiring wound treatment at the Queen elizabeth hospital in Birmingham. The WoundSense sensor will be used during negative Pressure Wound Therapy to monitor moisture levels in healing wounds without disturbing the dressing. Professor Patricia Connolly, CeO of Ohmedics and a bioengineer at the University of Strathclyde, is working with lt Col Steven Jeffery, Consultant Plastic Surgeon for the Defence Medical Services, and Dr erin hankin, both based at the Burns Unit in the Queen elizabeth hospital. lt Col Jeffery said: “We want to provide state-of-the-art treatment for our military personnel and be at the forefront of advances in wound treatment. NPWT involves the application of suction, via a dressing, to the wound area using a pump. This draws out exudate – wound fluid – and stimulates the healing process. however, before WoundSense came to the market, it was not possible to monitor moisture in a patient’s dressing in real time. Professor Connolly said: “We have been aware from the early stages of this technology that it would impact widely on wound treatment. in ordinary use the measurement of moisture in a dressing with WoundSense™ allows a nurse or carer to make a decision about changing a dressing without disturbing it.